1859 Cider Co. welcomes 2018! — 1859 Cider Co.
1859 Cider Co. welcomes 2018! 1859 Cider Co. is ready to dive into the excitement of a new year, and we hope you'll come along for the ride! After the hard winter we had last year, which limited apple yields to a mere 25% of their normal crop, we feel it's more important than ever to ensure a good 2018 harvest. In Southern England, there was a tradition known as wassailing that occurred each winter in the cider orchard. Folks would go out into the orchard where they would howl, dance, put slices of bread or toast at the roots or on the branches, and pour cider over the roots - all in an effort to ensure a fruitful crop for the upcoming season. 1859 Cider Co. is celebrating wassail in style by hosting a private cider and dinner pairing on Monday, January 15th from 6:30-8:30 pm. Perhaps it's a little more formal than simply having some bread or toast, but we think it's a good way to get together, honor some cider with some amazing locally created dishes, and bring about some good cheer for the upcoming harvest. The custom menu was created by Chef Michelle Smith-Harper of Harper's Wine House in Brownsville, Oregon. Please see the attached menu and you'll see why we're so excited about this Wassail event. It's also going to be the debut of our latest cider, the Chemeketan Pear, named after the original name of the Salem area, Chemeketa - meaning, resting/meeting place. We'd like to honor the land these pears came from, so meet up with us on January 15th for this event. This event is limited to 20 persons. Deadline to purchase a seat at the table is January 11th! Cost is $45 per person for this three course dinner with cider; full deposit is required for all RSVP's. Please arrange for payment either in the taproom or website. For double good fortune during the 2018 harvest, we are also pouring at McMenamin's Wassail Cider Fest on January 20th! McMenamins and eighteen other cider producers will be participating in for the second annual Wassail Cider Fest at Cornelius Pass Roadhouse. All-ages will be invited to enjoy live music, entertainment and general merriment, and for those 21 and up, cider tasting of over 35 different ciders! There will also be a parade down to the orchard for a “toast” to a bountiful cider harvest! Admission to the event is free; commemorative glass and tasting tokens can be purchased online or at the event. Wassail costumes are encouraged! Click HERE to check out their Facebook event. For fans of the "detox and retox" movement, we have TWO opportunities to mix cider with your exercise this month! First up we have "Cider and Muay Thai" hosted by the Salem Multicultural Institute as their final event of the Sawasdee, Thailand Series. This 2-hour class is perfect for beginners - no experience is necessary! The class will be led by Combat Sports Center, and will start with a brief lecture regarding the cultural importance of Muay Thai in Thailand. Also, we are thrilled to be continuing our monthly Yoga + Cider! This yoga class is held in the tasting room, before door open from 1:15-2:30pm, on the last Sunday of every month. Class is led by Yoga + Beer instructor, Mikki Trowbridge, and is all an all-levels flow yoga class. After class, yogis are invited to stay and enjoy a delicious cider! Your registration includes a 75 minute yoga class. This class is limited to 25 cider yogis, and always fills up. Please grab your spot in advance if you're interested in joining us. So, we are totally supportive of all our "resolutioners" out there and want to remind them that we never add sugars, honey or syrups! All real fruit, all the time! We ALSO are supportive of our friends that are already ready to give it up! You are busy, you took on too much, that glass of cider just looks too darn good to ignore. Whatever your reason to break your New Year resolutions, you can do it guilt-free on Ditch New Year’s Resolution Day. In the new year, try a few new things! 1859 Cider Co. is a great place to get out of your comfort zone a bit! We truly believe it's worth it! Try your hand at painting at Paint Night this month! Go to the link below to reserve your seat! Or, try Salsa lessons! 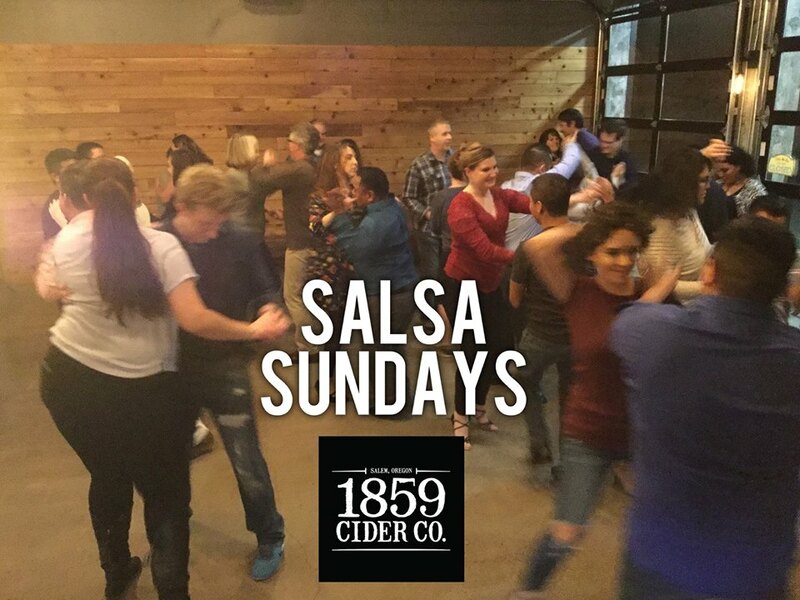 Every Sunday night the tasting room comes alive with salsa/ bachata dancing! Each Sunday, the basic steps, twirls, and hand loops used in dancing are covered. Please bring cash for your cover charge as it is paid at the door upon entry. Great for groups, couples or going solo! Be sure to keep an eye out for the live music coming to the tasting room this year! New and eclectic acts, every weekend! Music is most always from 8-10 pm, FREE and alternates between Friday and Saturday nights! Thanks again for an awesome end of the year! See you in the tasting room! Older PostFestivus for the Rest of Us!